Before endeavouring upon the drive from Skibbereen to Wicklow, I must first persuade the AA Route Planner that it’s a town as well as a county. When at last it gets the point, I’m shown that the quickest way is via Dublin. This is somewhat prescient, as the new festival of visual art I’m travelling to see had its genesis in the fact that Wicklow Town currently has “no cinema, no theatre, no music hall and no gallery for contemporary art,” and so, when it comes to cultural enterprise, the route planner’s advice holds true: you’d probably be better off going directly to Dublin. I’ve heard a lot of late about Ireland’s returning emigrants – the pharmaceutical engineers and marketeers and cloud solution architects – and their impact on economic growth. But what about the returning artists and their less easily enumerated effect? InktoberFest, which took place from October 1st – 3rd , was organised by Paul McCann, a NCAD graduate who recently came home after several years in London, studying in Chelsea College of Arts and working in the Barbican Centre. On settling in Wicklow Town, he noticed an absence, and set out to address it. The festival – brief in run, rich in detail – brought artists from elsewhere together with artists from there – in two vacant shop spaces and an assembly hall. There was no umbrella theme – McCann’s aim was to showcase what was going on anyway, wherever, unimpeded by umbrellas. 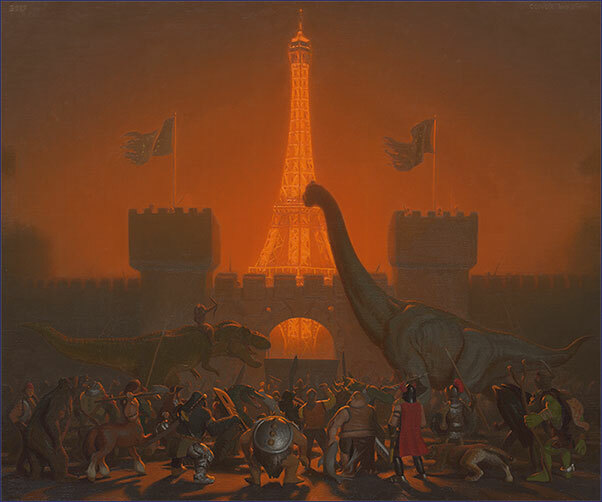 From Conor Walton’s old-master style oil painting of dinosaurs, warriors and a phosphorescent Eiffel tower to Ronan Tuite’s digital print of a mandala composed entirely of cartoon mice, InktoberFest was characterised by a certain candour, a note of devilment – the demeanour of something that really shouldn’t be there, but is. I drove back to Skibbereen with the feeling that perhaps the most interesting cultural enterprises are going on in the hinterlands of established institutions, publications and funding budgets – making up in sprightliness what they lack in polish. Sara Baume is a writer based in West Cork. InktoberFest, various locations, Wicklow Town, October 1 – 3.